There is a general consensus among historians who study the sport of American football to recognize a game played November 6, 1869 between teams from Princeton and Rutgers as the "first college football game". One hundred years later, during the fall of 1969, the football teams at Princeton, Rutgers, and many other colleges commemorated this centennial by wearing on their helmets a special decal depicting the numerals "100" inside a football-shape. 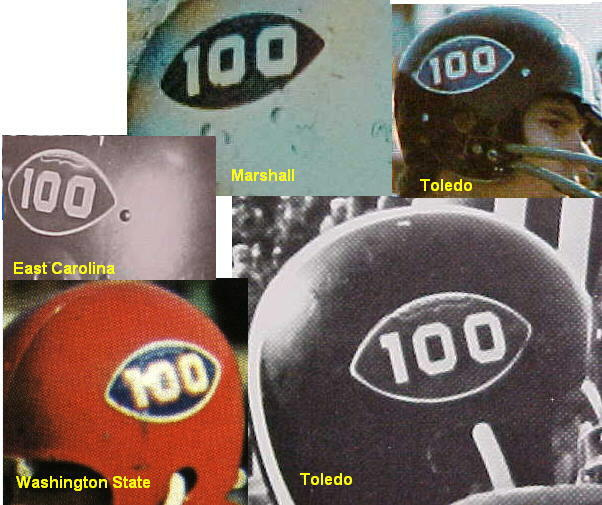 Some teams apparently used the "100" decals for only a single game, while others wore them throughout the season; usually these decals were placed prominently on the sides of the helmets, in place of the respective teams' usual helmet decals. It should be noted, however, that the vast majority of teams apparently used the 'Northern Illinois' version of the logo. Additionally, the decals were produced in at least a few different colors, which sometimes did not coincide with the official colors of the team wearing them. Nebraska, for example, used a blue football-shape, as did both Bowling Green and Washington State; Rutgers used a gold or yellow football-shape. Having studied this matter for a number of years I have reached the conclusion that most teams which used these decals apparently used a blue version of the football-shape, with white numerals outlined in red. Furthermore, I cannot say that I have ever seen color photographs of these decals in which the football shape is clearly red, maroon, green, orange, or black (unless one has slipped my mind). (Update: Missouri apparently used a black football-shaped logo, Texas DID use a burnt orange logo, and Oregon State used a logo that was almost certainly orange). I have added red ones to the website for New Mexico State and Southwest Missouri State, but these were done in the very early days of the website (c.2000) and I might have at that time relied upon descriptions of the color provided by a contributor to the website - I cannot say that I remember seeing color photographs of either the NMSU or SWMSU helmets. The 1970 NMSU and SWMSU yearbooks are available online but neither contains any color photographs of 1969 helmets for those teams. Following is a table listing the colleges known to have used the "100" logo during at least one game in 1969 - there were probably many others, and I would appreciate additional reports (including for small colleges). Akron gold ? ? Logo worn only on right side of helmet? Arizona State yellow ? ? Bishop (TX) white ? ? Brigham Young white ? ? Logo worn only on left side of helmet? Davidson gold? or silver? ? white? Delta State (MS) white blue? white? East Carolina gold ? ? Florida A&M orange? ? ? Fresno State red? ? ? Hiram Scott (NE) white ? ? Hope (MI) blue ? ? Miami (FL) gold ? white? Northeast Louisiana red ? ? Otterbein (OH) white ? ? Pacific Lutheran (WA) black ? ? Princeton orange black white Contradictory reports received as to Football-shape color (blue vs black). It has been reported that a "100" helmet (with black football shape) is present in the "Coaches' Lounge" at Princeton (still no color photos received, though). South Carolina State white ? ? Southwestern (TN) silver? ? white? Susquehanna (PA) orange? ? ? Does anyone know of an existing, game-worn helmet from the year 1969 featuring one of these original decals? (One is reported to be at Princeton, see note in table above, and another in the possession of a former Syracuse player, see note in Syracuse section). People often request the artwork for this decal; below is the best copy I have at the present time.